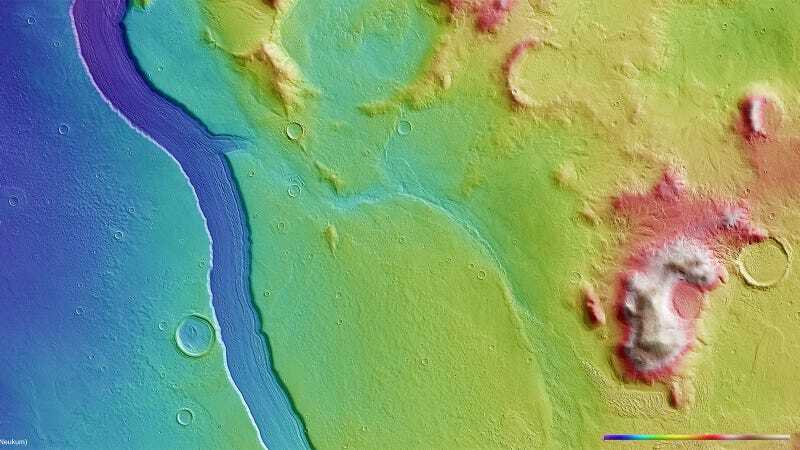 Planetary scientists at the European Space Agency have released 3D images of the "striking upper part of the Reull Vallis region of Mars," which reveal a 932-mile-long (1500 kilometer) river running from the Promethei Terra Highlands to the vast Hellas basin. This river was huge. The image data from ESA's Mars Express spacecraft shows that, at some points, the riverbed is 4.3 miles (7 kilometers) wide and 984 feet (300 meters) deep. The stereo cameras onboard the satellite have also revealed "numerous tributaries" that fed the gigantic river. On the right of the images you can see the Promethei Terra Highlands's mountains, "rising around 8,202 feet (2,500 meters) above the surrounding flat plains." A spectacular landscape not very different from many on Earth. The ESA Mars Express team says that the river was flowing with abundant water about 3.5 to 1.8 billion years ago, during the Hesperian period. After that, the Amazonian era started, causing the Reull Vallis to be invaded by a glacier. This glacier carved the valley where the river was, pushing debris and ice, and causing the sharp sides you can see in these images. These analogies are giving planetary geologists tantalising glimpses of a past on the Red Planet not too dissimilar to events on our own world today. Top view in natural color. A perspective view, with one of the tributaries connecting to the gigantic river in the middle. The arrows point at the main river and one of the tributaries. If you have stereo anaglyphic glasses, you can see this in 3D.